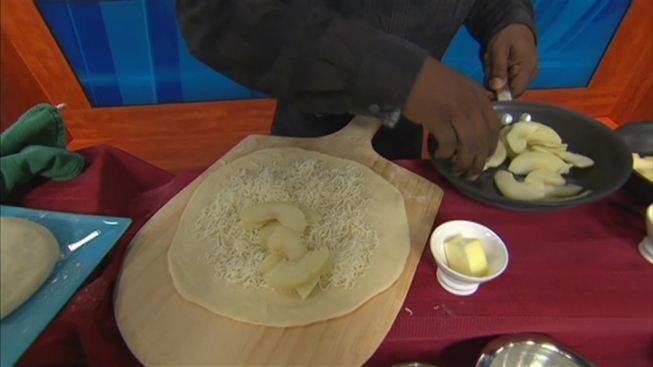 Make a savory apple, chicken and sage pizza and a sweet dessert pizza with apples, cheddar cheese and cinnamon. It's apple season again. And, having made pies, tarts, and gluten free crumbles in the past, I wanted to try something new this year and the thought of pizza came to mind. Because apples are great in both sweet and savory dishes, I experimented with making a savory apple pizza with chicken and sage and a dessert pizza with apples, cheddar cheese and cinnamon. Both versions are pretty tasty. The pizza dough recipe and each toppings recipe below are for for two 11" pizzas. But, you can cut the toppings ingredient list in half with each recipe and make one sweet and one savory pizza if you like. That works well for making one pizza for an appetizer and one for dessert. If you're interested in some of my past apple dishes, I've posted the recipes or links below. Place yeast and 2 tablespoons of flour in a medium sized bowl. Slowly add 1/4 cup of warm water while stirring with a fork or small whisk until fully blended. Stir in Olive oil and let mixture site for 15 minutes while yeast activates. Place remaining flour in a large bowl and add salt. Pour yeast mixture into flour along with 1/3 cup of water. Mix until dough comes together. Place dough on a lightly floured surface and knead for 10 minutes until dough is elastic. Pour about 1 teaspoon of olive oil in a large bowl. roll dough in oil to coat all surface. Cover bowl and let dough rise for an hour until double in bulk. Preheat oven to 500 degrees F. These pizzas are great using a pizza stone, but will also cook well on a baking sheet. Melt butter in a saucepan over medium high heat. Add apples and salt and sauté until apples are just tender, about 4 minutes. Remove from heat and set aside. For each pizza, roll out half of the dough to form an 11" circle. Place dough on a floured pizza peel if you have one and are using a baking stone. If not, place pizza curst on a baking sheet or pizza pan. Top the crust with half of the mozzarella, half of the sautéed apples and half of the chicken. Sprinkle half of the fresh sage on top. Bake pizzas in the oven until crust is golden brown, about 6-8 minutes. Remove from oven, slice and serve. Melt butter in a saucepan over medium high heat. Add apples and brown sugar and sauté until apples are just tender, about 4 minutes. Remove from heat and set aside. For each pizza, roll out half of the dough to form an 11" circle. Place dough on a floured pizza peel if you have one and are using a baking stone. If not, place pizza curst on a baking sheet or pizza pan. Top the crust with half of the mozzarella, half of the cheddar cheese and half of the sautéed apples. Sprinkle half of the cinnamon on top. Bake pizzas in the oven until crust is golden brown, about 6-8 minutes. Remove from oven and lightly dust with powdered sugar and garnish with fresh mint. Slice and serve with whipped cream (optional). Prepare crust by cutting butter and cream cheese into the flour and mixing until a dough forms; or place all three ingredients in a food processor and blend until dough comes together. Wrap dough in plastic and refrigerate for 30 minute. Remove and roll out on a lightly floured board, creating a circle about 11" in diameter. Transfer dough to the tart pan and uniformly press the dough into the fluted sides. Refrigerate pan for an hour. Peel and core four apples. Thinly slice apples and then roughly chop. Melt half of the butter in a large saucepan over medium heat. Add apples and stir to combine. Add 1/4 cup of sugar and cook until apples are tender, about 25 minutes. Stir often. Remove from heat and add vanilla. Allow mixture to cool completely. Fill a large bowl with about 4 cups of cold water. Zest half of the lemon and set zest aside. Squeeze the juice from all the lemon into the water. Peel and core the remaining apples. Cut each in half and then evenly slice each half lengthwise into 1/4" slices. Add slices to the cold water to keep them from browning. Remove chilled tart from the refrigerator. Spread the sautéed apples evenly on the bottom of the tart. Drain the freshly sliced apples and spread them on a paper towel. Starting on the outer edge of the tart, overlap apples to form an outer ring. Repeat with a second row of apples slightly overlapping the first. Create a third row if possible and then finish by placing a few apple slices in the center. Melt the remaining 3 tablespoons of butter and pour over sliced apples. Use a pastry brush if you have one to make sure all exposed surfaces are coated. Mix together the two remaining 2 tablespoons of sugar with the cinnamon and sprinkle over the top of the apples. Place tart on a baking sheet and bake for 60 to 80 minutes or until apples are tender and browned on the edges. Remove from oven and let rest for 30-40 minutes. Serve at room temperature. Great with vanilla ice cream. Combine flour, margarine and cream cheese and mix together with your hands, breaking margarine and cream cheese down into smaller bits. Continue blending until the flour has been incorporated and dough holds together. Divide the dough into two equal parts. Roll each into a ball and flatten slightly. Wrap each in plastic and refrigerate for an hour. Preheat oven to 425 degrees. Peel, core, and thinly sliced apples. Mix with lemon juice. Set aside. In a separate bowl, mix sugars, flour, cinnamon, nutmeg, and lemon zest. Place one pie crust in a pie pan and allow edges to extend over the sides. Layer half of the sliced apples on crust. Top with half of the sugar mixture. Repeat with remaining apples and sugar. Dot the top with pieces of the butter. Roll out second crust. Cut four to five teardrop shapes (about 11/2 inches long) around the center to vent pie as it cooks. Place crust over apple and sugar mixture allowing edges to extend over lower crust. Crimp two crust edges together using your fingers. Brush the top with milk and lightly sprinkle sugar, nutmeg and cinnamon on top. Loosely cover pie with aluminum foil and place it on the middle rack of the oven. Bake for 35 minutes. Remove aluminum and bake for an additional 15 to 20 minutes until crust is golden brown.